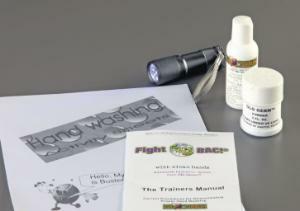 Demonstrate the proper procedures used to prevent the spread of infectious disease with this compact handwashing kit. With a 2 oz. bottle of Glo Germ Gel, 1.2 oz. of Glo Germ Powder, and standard UV light with battery, you have enough supplies to lead over 50 demonstrations with your students in handwashing training and cross-contamination testing. For a complete learning experience, a full set of student activity sheets and trainer's manual are included with this kit.